The following five numbered items appeared at the dates indicated on different pages in the original version of the Around Naples Encyclopedia. They have been consolidated here onto a single page. I had an interesting discussion last night with the gentleman who runs the little bar down at the corner. It was about the Nobel Prize this year for physics. One of the winners was Riccardo Giacconi, an Italian who has been living in the US for the last 40 years. Italy, it seems, drives away—as immigrants—not just the "tired, poor and huddled masses," but great numbers of doctors and scientists. 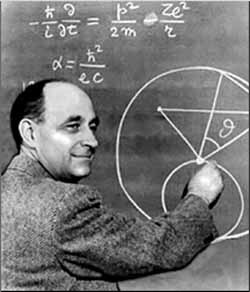 The classic case, of course, was Enrico Fermi (photo), who went to America in the 1930s to protect his Jewish wife from Fascist Italy's racial laws. Giacconi said in an interview that he had left Italy in order to be able to work, meaning that even as an up-and-coming young physicist in Italy it was simply too hard to fight a system that keeps you from getting anywhere unless you are somehow "connected". The guy at bar says that things haven't changed much and trotted out numerous stories from his own experience. He liked my own favorite story. I ran into a young Italian doctor one time who had just come back from an internship in the US. He told me that on his first day in the US he was strolling on the campus of the university hospital where he was going to be working, when an "old guy" yelled at him from across the way: "Hey, do you play tennis?" He did and wound up as the doubles partner of the "old guy"—who, as it turned out, just happened to be the head of the hospital! Young doc was made to feel totally at home and welcome, which amazed him and continues to amaze most Italians I tell that story to. The idea that a person at the top would befriend someone just starting out is, well, not something that happens here. In the words of the guy at the bar, "You climb over people to get to the top and then try to keep people from climbing over you." In Italian, the term extracomunitari refers to those persons from outside the European community. Technically, that includes Canadians, citizens of the USA, Australians, and Martians—and it is true that citizens of those countries and planets stand in the extracomunitari queue in airports. Yet, in general terms, everyone in Naples knows what extracomunitari really means. It refers to Asians, Africans and people from the Balkans who wash up on southern Italian shores in search of a new life. Very often, they really do wash up on the shores, having been abandoned by heartless refugee smugglers who think nothing of dropping a pregnant woman into the sea, 100 yards from shore, and speeding off to pick up another boatload of people who will do anything to get into Europe. Many of the immigrants wind up in the grey world of peddling wares of one sort or the other on the streets, either on Via Toledo or Corso Umberto, two of the main drags in town. They lug their goods to and fro in those huge zippered duffel bags of the kind that scuba divers use. They generally set up right on the sidewalk (photo): first a tarp—or maybe just large piece of cardboard—on the ground, and then they unload the leather handbags and belts, assorted trinkets, even small African musical instruments and carved animals. Some of those may even have been carved in Africa, though maybe they were done at “home” in Torre del Greco, a town near Naples right on the slopes of Vesuvius. Many of the African extracomunitari live there, sharing flats—nothing unusual in what is, anyway, the most densely populated area in Europe. Usually, they are left alone, even by the police. Yet, there is such a thing as “vendor overload” on any given street, I suppose, and if they are set up right in front of your store on the sidewalk and selling tax-free contraband handbags and draining customers away from your shop that sells the real taxed deal—well, then, you are going to call the cops and let the chips fall where they may. That’s what happened yesterday on via Roma. The police move in on street vendors with all due lack of deliberate speed. The point is not to arrest 25 poor bastards and confiscate their stuff; the point is to roust them, send them packing and give the merchants of the area a breather. The extracomunitari peddlers have a nose for trouble and the minute the roust starts up at the end of via Roma, the grapevine is electrically fast; within seconds they are gone—right down to the end of the street they have packed up and left in no time flat. It is difficult to leave home, and, for whatever reason, it is very difficult for Neapolitans. The 1925 tear-jerker evergreen of the emigrant Neapolitan song is “Lacreme napulitane”. It is in the form of a letter from America, written home by a son to “dear mother” in Naples. It is a lament of how difficult it is to be far from home, away from the sound of the zampogna, (the Neapolitan bagpipes, traditional at Christmas), and away from the “sky of Naples”. The refrain starts with the cry, “How many tears America has cost us” and ends with “How bitter is this bread”. 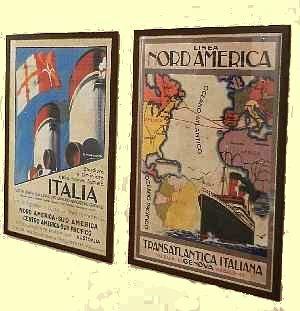 The so-called Neapolitan diaspora—the great waves of emigration from Naples and southern Italy to the Americas, especially the United States, Canada, Brazil, and Argentina—was part of the pattern of large-scale emigration from Italy, in general, in the late 19th and early 20th centuries. Between 1876 and 1913, 11.1 million Italians left. Depending on just how one defines the area under scrutiny—the city of Naples, the province of Naples, the region of Campania, or all of southern Italy (including Sicily and Sardinia)—most reliable estimates claim that at least 4 million of those who left were from Naples or near Naples. The general rule that "emigration from cities was negligible" has an important exception, and that is the city of Naples. The city went from being the capital of its own kingdom in 1860 to being just another large city in Italy. The disrupted bureaucracy and financial situation encouraged unemployment. Also, in the early 1880s, grave epidemics of cholera struck the city, causing many people to leave. The epidemics were then the driving force behind the decision to rebuild entire sections of the city, an undertaking known as the risanamento (lit. "making healthy again") and one that lasted until World War I. That process of tearing down and rebuilding also disrupted urban life and became another reason for many to leave the city. Today, generations after emigration took southern Italians over the seas, there has arisen a different kind of “emigration,” one within Italy, itself. It strikes non-Italians as strange, but Neapolitans or Sicilians who moves to Milano for a job—as so many of them have done since the Italian “economic miracle” of the 1950s and 60s, will often say that they have “emigrated,” using the exact same terminology they would if they had moved to New York or Frankfurt. After all, Milan can be just as cold, foggy and foreign as those other places—and you can barely understand the language and, God knows, you sure can’t eat the food up there! One difference between the overseas emigration of many years ago and the newer emigration within Italy is that many of the “new emigrants” try to make it home as often as every weekend. Depending on exactly what northern industrial money-machine they work at and where they live in the south, this can mean a four or five–hundred–mile train ride, once a week. The routine is rough: get off work on Friday afternoon, rush down to the station, catch the overnight train (nicknamed the “Fog Express"), get off nine or ten hours later, catch up on sleep on Saturday, spend Saturday evening and some of Sunday with the family, pile back on the northbound train Sunday evening, get into their northern destination early Monday and rush to work without really having slept on the train. Sleeping berths and express trains generally cost more than the average worker will be able to spend every week; even the bare-bones second-class seat runs 60 euros for a return ticket. Two-hundred and fifty euros a months is too steep for some, and the word among the “commuter emigrants” at the station is that if you jump in the last car and stand in the corridor all night, the conductor is a pretty good guy and may just not notice that you have no ticket—after all, he knows you’re just trying to get home to see your kids. A few manage to grind out the miles like this, week in and week out. Very few manage to last, year in and year out. The turnover is enormous; that is, every month, 35 out of 100 southern workers in northern Italy will quit, to be replaced by other commuters, who presumably will last a while and then, in turn, call it quits themselves. McDonald, J.S. "Some Socio-Economic Emigration Differentials in Rural Italy, 1902-1913". Economic Development and Cultural Change 7 (1): 55-72, October, 1958. Moretti, E. "Social Networks and Migrations: 1876-1913" International Migration Review, vol. 33, No. 3 (Autumn, 1999), pp. 640-657, published by The Center for Migration Studies of New York, Inc. The terms “multicultural” and “multiethnic” present a certain paradox when thinking about Naples. At times, looking at the long history of the city, it seems that it must have always been a grand mixture of different peoples. When the Spanish first got here in the 1500s, for example, Spanish soldiers, officers, diplomats, and merchants suddenly occupied most of the area near the Royal Palace. That is the area still known as the "Spanish Quarters”. Of course, there are no Spanish there, any more. Whatever was separately and distinctly Spanish about the area is now totally Neapolitan. Taking that which is foreign and making it your own is very characteristic of Naples. The Spanish experience has surely been repeated many times over the centuries. Naples seems to be a giant blender that homogenizes whatever might start out to be separate and distinct elements in society. Thus, it is, yes, multicultural, but then very quickly Neapolitan. The Naples daily, il Mattino, uses the term “multicolor” to describe the relatively new phenomenon of immigrant children in Naples attending local public schools. Naples has never been a racist culture, so the journalist uses such terms quite innocently. She is merely describing what for her is new and fascinating when she writes about a little girl as “three–and–a–half years old, a tiny thing with grand eyes, wearing a rose-colored checkered school blouse that contrasts with her coal–black skin." Also, the Neapolitan public school system is now dealing with the fact that Naples, for whatever reason, is home to thousands of immigrants. They may be newly arrived refugees from eastern Europe, au pair from almost anywhere in the world, African street vendors, or Rom—gypsies. The consensus among teachers is that there are no problems having to do with a pupil being of a different race. (That is gratifying, but I would have predicted that.) There are the same language problems, especially with older students (say, above the age of 12) that you find almost anywhere in the world in schools where children are suddenly required to learn a new language. Socially, there is some problem in getting parents in particularly intransigent immigrant groups such as gypsies to send their children to local schools in the first place. Volunteers regularly go out into the community to try to convince these parents to do what is best for their children. Partono i Bastimenti (The Ships are Leaving) is the first line of Santa Lucia luntana (Santa Lucia Distant), one of the best-known Neapolitan songs of emigration (1920, by E.A. Mario) and, not coincidentally, also the name of an exhibit on Italian emigration to North and South America currently running on the premises of the Suor Orsola Benincasa university. I commented in an earlier entry, here, on plans to install a permanent Emigration Museum in Naples. That has not happened, nor am I aware that it is going to happen anytime soon. If it does, the materials from this exhibit would be a fitting contribution. The exhibit runs through Dec 13 and it would be a great shame to see it all dismantled and stored away somewhere to gather dust. Between 1861 and the early 1960s, more than 25 million persons left Italy. This phenomenon of emigration, people leaving their homes behind in search of answers to their economic problems, was one of the most intense episodes of social unrest in the history of our nation. Emigration characterized 100 years of our national history and was not only a southern phenomenon, as we are often led to believe. At least at first, it was centered in the north; between 1876 and 1900, more than half of those who left were from three northern regions: Veneto, Friuli Venezia Giulia, and Piedmont. The great explosion of southern emigration followed in the period leading up to WWI, particularly from Calabria, Campania, Puglia and Sicily. They were almost all bound for North or South American. Today there are 64 million descendants in the world of those who left Italy for the United States, Argentina and Brazil. As you approach the entrance along one of the large corridors in the university and turn up a flight of stairs, you see the first introductory posters, almost all of them of large ocean-liners advertising for passengers to the New World. The exhibit is laid out in a single long room. You walk up one side and down the other. Photographic and other pictorial displays are along the walls. There are large table and mounted poster displays in the middle of the room as you walk along. You also hear the voice of Enrico Caruso throughout the entire exhibit, singing some of the many songs of emigration as well as some better-known Neapolitan songs. Caruso, of course, was the prime example of the emigrant who made good in America. There is, of course, a display board devoted to many of those who did well in America, even well before Caruso, from the strange case of Mozart's librettist, Lorenzo Da Ponte to the first Italian-American to rise to a position of prominence in the New York City police department, Joseph Petrosino—and then those well-known celebrities of succeeding generations such as Joe DiMaggio and Frank Sinatra. There are a lot of blown-up black and white photos of 3rd-class emigrant passengers crowding the decks of ships, happy to be out of the hell-holes of steerage for a few hours a day; scenes of arrivals at Ellis Island in New York, scenes of Little Italy in New York, and heartrending newspaper accounts of some who didn't make it: "August 14, 1906. The vessel Siro sailing from Genoa and bound for New York, wrecked and went down off the Spanish island of Hormigas. Three-hundred passengers, almost all third-class, perished." 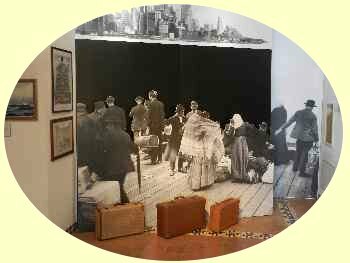 There are displays of emigrant paraphernalia: battered cardboard luggage, passports, instructions on how to survive in America; a display of sheet-music of songs written about leaving home; books about emigrants and immigrants. There is a separate section dedicated to those who went to South America (see this link), including a display case of the musical instruments they played, and so on and so forth. 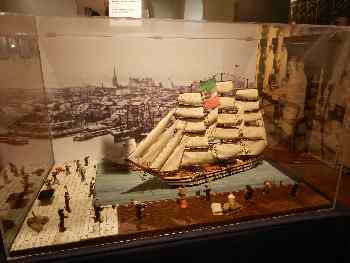 There are a few table-top displays of models of ships; one shows Bourbon POWs taken by Garibaldi during the conquest of the Kingdom of Naples boarding a ship to sail for New Orleans in 1861 to fight for the Confederacy! (That story is here.) Another (photo, above) is of the warship, Carolina, of the Bourbon Navy (that is, of the Kingdom of Naples) in port in New York in May of 1848, where the captain, in favor of the unification of Italy, ordered the new Italian tri-color flag to be raised on the vessel to the delight of Italian immigrants standing at the docks; it was the first display in the United States of the flag of the future united Italy. 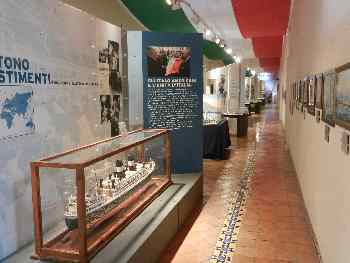 The exhibit was planned and financed by the Rome-Mediterranean Foundation and installed by Francesco Nicotra, director of special programs for the National Italian American Foundation. They really do have to find a permanent home for an exhibit this good.